WHAT IS THE PELICAN SOCIETY? We're proud to announce a membership program for parents and teachers who love the CenterForLit approach to all things literary. The Pelican Society exists to encourage its members in their noble work as teachers, to rejoice with them in the privilege of training the young, and to equip them to join the Great Conversation. To equip parents and teachers with the tools they need to feel confident in their ability to lead students into a love and understanding of literature. We already believe you are capable and that God has given you exactly what you need for your task. However, the confidence provided by continued personal training can fill us with peace and calm as we stand before our students. To provide an oasis of grace for all teachers, parents, and readers. There are so many standards to live up to, so many laws to keep. So often we retreat into our loneliness or put up a pretense of success. There's no need for that here. If there's any theme that is more prominent than any others throughout the Great Books, it is the strength that comes from a community founded on common weakness and failure. By reading and talking together about books, our schools, or even the news of our everyday chaos, may we find that true friendship described by C.S. Lewis: "What? You too? I thought I was the only one!" Members receive discounts on all of our materials and resources, including Members-only discounts on Online Academy tuition for the upcoming school year. Members receive exclusive access to our Quick Card library, with bullet-style summaries of teaching points for dozens of classic stories. We currently have over 100 titles, with more added all the time (download a free sample). "The Tyranny of the Booklist"
Members receive free enrollment in our Pelican Book Club, featuring live discussions of literary bestsellers. Past book club recordings are available for download to members only, and include Home by Marilynne Robinson and Brideshead Revisited by Evelyn Waugh. Members receive exclusive access to the Pelican Forum, our chat room for parents and teachers. Click the button below to sign up. You'll enter the Pelican Society lobby, from which you can access every corner of our website. We'll add resources each and every month, and notify you every time there's something new. Membership dues are $9.00 per month. You pay with a credit card and cancel any time with a single click. Sign up for a whole year for $99.00 and receive a month free! 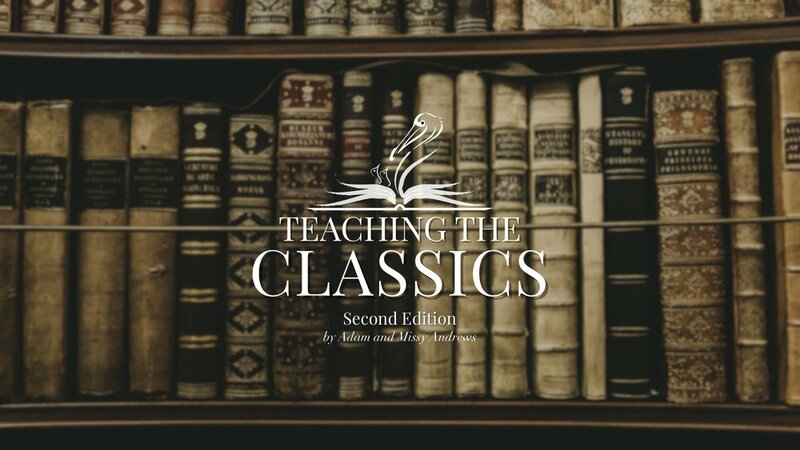 We are delighted to offer complete digital access to our Teaching the Classics basic seminar! Join the Pelican Society as a Premium member to stream the video sessions and download the course materials in PDF format. Enjoy all other member benefits as well, of course!